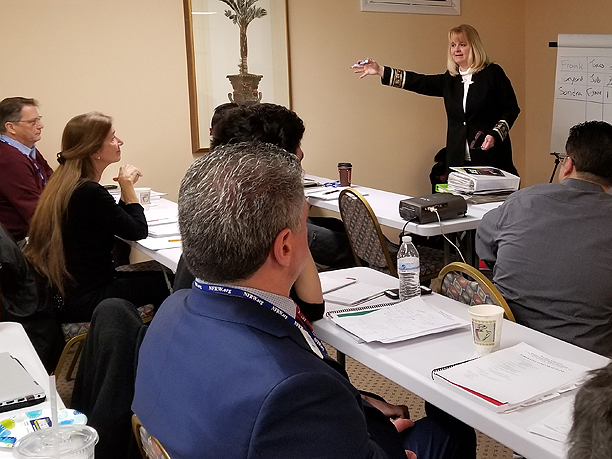 Holly Robichaud, long-time NFRW Campaign Management School instructor, trains Republican candidates at the Campaign Management School in Dover, Delaware. Consider bringing the NFRW's acclaimed Campaign Management School to your area for comprehensive training and instruction by top-notch political experts. When Republican women formed the NFRW in 1938, they adopted political education as one of the fledgling organization's primary objectives. Today, the NFRW effectively pursues this long-time objective by training Republicans to win elections through the highly-successful Campaign Management School (CMS) program. The CMS program is designed to provide a comprehensive overview of campaigns. Schools feature top-notch political professionals and strategists who have a wide range of knowledge and experience. These experts volunteer their time to teach students the most successful ways to raise money, write winning campaign plans, organize volunteers and communicate with voters. Campaign fundamentals covered include creating a campaign budget and a finance plan, earned and paid media, social media and the Internet, strategy and message development, opposition and issue research, voter targeting and voter identification, get-out-the-vote activities, recruiting and managing volunteers, direct mail, organizing events, asking for money, and putting together a finance committee. All Republicans -- both women and men -- are welcome to attend. "We all walked out of the training feeling that it was time well spent, that we would attend the class again, and that it was a hugely valuable experience." "I've taken this class and recommend it to anyone involved in campaigns. Candidate. Volunteer. Staff." Check for upcoming Campaign Management Schools. Help bring a school to your area. Contact the Campaign Management School coordinator. Read about the NFRW's historic commitment to political education.